When ambitious young real estate agent Leigh (Catalina Sandino Moreno) is asked to sell a house with a checkered past, she crosses paths with a disturbed girl whom she learns is the runaway daughter of the couple selling the property. When Leigh tries to intervene and help her, she becomes entangled with a supernatural force that soon pulls Leigh's artist sister Vera (Naya Rivera) into its web and has sinister plans for both of them. With 2014’s At the Devil’s Door, we get a new take on the “devil possession” genre. In a prologue, teenager Hannah (Ashley Rickards) plays a game with supernatural repercussions so she can earn $500. Unseen forces attack her in her home, but we don’t see the ultimate outcome. From there we meet Leigh (Catalina Sandino Moreno), a real estate agent who attempts to sell a property owned by a couple eager to move the house. While there, she sees a mysterious teenage girl who runs away when Leigh approaches her. Leigh’s experiences get weirder and weirder and intercut with more from the odd actions that befall Hannah as we build toward confluence and additional developments. If nothing else, Door gets credit for its refusal to telegraph its plot points. While we understand that the Hannah and Leigh narratives will eventually connect, the tale progresses in a way to make these sides fairly mysterious, and that helps motivate our interest. To a degree, at least. Unfortunately, Door lacks much of a real plot, and “slow and moody” doesn’t equal “scary and compelling”. Door takes its own sweet time to go anywhere, and even when it develops more obvious “action”, it still doesn’t seem especially involving. In addition, the movie’s decision not to make its path all that obvious can backfire. While I admire the lack of telegraphed material, Door can go too far in the other direction, as it seems frustrating in its vagueness. I often get the impression the movie opts for the absence of clarity mostly because Door just doesn’t have a lot to say. It tends to substitute moody ambience and loud jolts for actual storytelling, and those techniques only go so far. 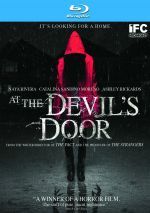 It doesn’t help that even though Door tries to subvert traditional storytelling in some ways, it finds itself dependent on tired horror tropes to maintain some semblance of viewer interest. This means the usual batch of jolts and jerks that make up “scares” in many genre efforts. At the Devil’s Door appears in an aspect ratio of approximately 2.35:1 on this Blu-ray Disc. The transfer consistently seemed satisfying. Like most modern horror movies, Door went with a stylized palette. The Hannah scenes opted for a yellow-orange, while Leigh’s segments took on more of a blue/teal. Within those constraints, the hues were appropriate and well-rendered. Blacks seemed dark and tight, while shadows showed nice delineation and didn’t appear too dense. Overall, this was a positive presentation. Similar thoughts greeted the fairly good DTS-HD MA 5.1 soundtrack of Door. The soundfield mostly delivered a mix heavy on atmosphere. Ominous noises cropped up in the side and rear speakers, and scare moments added to the track. The mix also used storms/rain as an active participant. Those elements created a nice sense of place and added impact to the material. Audio quality satisfied. Speech sounded crisp and distinctive, and music appeared robust and full. Effects were accurate and dynamic. Low-end response showed good thump and richness. Nothing here dazzled, but the audio merited a “B+”. We find a mix of extras here, and these start with an audio commentary from writer/director Nicholas McCarthy. He offers a running, screen-specific look at the project’s origins and development, music, visual design, cast and performances, influences, effects and related subjects. From start to finish, McCarthy delivers a simply terrific commentary. He delves into a strong mix of topics and does with in a thorough, honest manner. McCarthy offers one of the best chats I’ve heard in a while, as he covers his movie in splendid fashion. Speaking of the Devil: The Making of At the Devil’s Door runs 18 minutes, four seconds and delivers info from McCarthy and actors Catalina Sandino Moreno, Naya Rivera, Ashley Rickards and Ava Acres. “Speaking” discusses the movie’s origins and development, story/character areas, cast and performances, influences and editing. A smattering of decent observations pop up here but not enough to make this a consistently interesting piece. Six Deleted Scenes go for a total of 11 minutes, 39 seconds. These do little more than extend existing sequences. Given that the final cut already seems slow and meandering, it wouldn’t have been good to add them. We can watch the deleted scenes with or without commentary from McCarthy. He tells us about the segments and lets us know why he cut them – usually. McCarthy’s observations offer some insights. The disc opens with ads for Cam2Cam, Witching & Bitching, The Damned and Premature. We also find a trailer for Door. At times, At the Devil’s Door shows promise, mostly due to some unconventional elements. Unfortunately, it lacks much purpose and relies too much on cliché “scare beats” to prompt viewer attention. 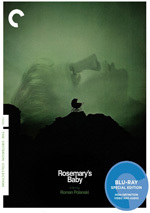 The Blu-ray offers pretty solid picture and audio along with supplements highlighted by a terrific commentary. Door ends up as a slow, lackluster effort.